December 2: Board Meeting at Safeway Community Room - 7 pm sharp! All Club Members are welcome. December 16:: Club Meeting at the Tracy Transit Station at 7 pm. Annual meeting of the membership and member's slide show where you can share this past years travels with the club. November 4: Board Meeting at Safeway Community Room - 7 pm sharp! All Club Members are welcome. November 18:: Club Meeting at the Tracy Transit Station at 7 pm. This month's guest speaker is Robert Tamson. Robert's presentation will be on Fly Fishing Montana... Unguided. October 7: Board Meeting at Safeway Community Room - 7 pm sharp! All Club Members are welcome. October 21:: Club Meeting at the Tracy Transit Station at 7 pm. 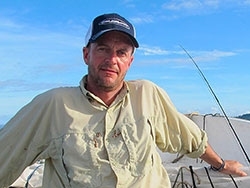 This month's guest speaker is Bill Ferrero of Mokelumne River Outfitters. Bill's presentation will be on fishing the Lower Mokelumne River below Camanche Dam. September 2: Board Meeting at Safeway Community Room - 7 pm sharp! All Club Members are welcome. September 16:: Club Meeting at the Tracy Transit Station at 7 pm. This month's guest speaker is Leo Gutterres. Leo will be demonstrating the art of making balsa wood bass poppers and twisted leaders. August 5: Board Meeting at Safeway Community Room - 7 pm sharp! All Club Members are welcome. August 19:: Club Meeting at the Tracy Transit Station at 7 pm. This month's guest speaker is Doug Ouellette. July 1: The TFF Board is taking a break this month. Board meetings will start back up in August. July 25:: TFF Family Picnic at Tracy Wildlife - 12222 Finck Rd. 11 am to 2 pm The club will be providing Lockeford Sausages and everyone is encouraged to bring a side dish to share and your own beverages. June 3: Board Meeting at Safeway Community Room - 7 pm sharp! All Club Members are welcome. June 18 - 21:: Club Outing - Lake Davis. The outing is limited to Members Only and the club will be covering your campsite fees. Click here for more information. June 24:: Club Meeting at the Tracy Transit Station at 7 pm. This month's guest speaker is Captain Kevin Doran. "KD", as he is more commonly known, will be presenting "Delta Top Water Basics and Beyond for Largemouth Bass & Stripers". KD will be discussing tactics, identifying productive habitat, tides, tackle and more. May 6: Board Meeting at Safeway Community Room - 7 pm sharp! All Club Members are welcome. May 16:: Club Outing - Pinecrest Lake. Click here for more information. May 20:: Club Meeting at the Tracy Transit Station at 7 pm. This month's guest speaker is John Sherman. April 1: Board Meeting at Safeway Community Room - 7 pm sharp! All Club Members are welcome. April 15:: Club Meeting at the Tracy Transit Station at 7 pm. This month's guest speaker is Jay Murakoshi. March 4: Board Meeting at Safeway Community Room - 7 pm sharp! All Club Members are welcome. March 13 - 15: Pyramid Lake outing. Contact Jeff Fadden. March 18: Club Meeting at the Tracy Transit Station at 7 pm. This month's meeting will showcase fly tying. Pizza will also be served. February 4: Board Meeting at Safeway Community Room - 7 pm sharp! All Club Members are welcome. February 18: Club Meeting at the Tracy Transit Station at 7 pm. This month's guest speaker is Jeff Currier. February 20 - 22: The Pleasanton Fly Fishing Show at the Alameda County Fairgrounds. Show hours are: Fri 10am to 6pm - Sat 9am to 5:30pm - Sun 9am to 4:30pm. January 3: Annual Club Installation Dinner at the Tracy Community Center (950 East St). Doors open at 4 pm. This year's event has SOLD OUT. January 17: Strategic Planning Meeting at the Banta Inn. All Club Members are welcome and we would like to request that all Board Members be present. Breakfast meeting begins at 9 am. Congratulations also to Cathy Hiromoto for being named the recipient of the 2014 Dry Fly Award! Robert’s program at the November meeting will be on the fantastic fly fishing opportunities in the Big Sky Country of Montana. His presentation will mainly cover 3 of Montana's Blue Ribbon Rivers: The Beaverhead, The Missouri and The Bighorn. Robert has gained his experience on these famous Montana waters by spending the last several summers living on the cheap, as a flyfishing hobo, streamside in his travel trailer. He will share with us the when, where and how to fish for big trout …without the need or expense of hiring a guide. As a native Californian, Robert has been flinging flies at fish since age 11. Currently and over the last 15 years, he has held the position as Director of both the Wilderness Unlimited Fly Fishing School and the Becoming an Outdoors Woman of California fly fishing programs. Now retired from his real job as a Real Estate Broker, he puts in over 200 days on the water annually in both fresh and salt water from California to Florida and beyond. This will surely be a great presentation for any fly angler who is considering a DIY fly fishing trip to Montana! Bill was born in Stockton and grew up in Lodi. His parents built a home in Lodi on Turner Road in 1957 by Lodi Lake, when the city limits for the north boundary of Lodi ended at Lockeford Street. This was Bill’s introduction to rural living, the Mokelumne River and fishing. One of his favorite memories is watching his father navigate Turner Road in a row boat and probably wondering why he was building a house before Camanche Dam and the flood control levees were in place. As early as the age of six years old, Bill was fascinated with Lodi Lake, fishing and exploring what is known now as the Lodi Lake Wilderness Area. His obsession pursuing trout started with hooking and landing his first wild rainbow along the Dardanelles section of the Stanislaus River. Bill’s uncle Merle introduced him to fly fishing in his teens on numerous trips to Nevada and Idaho. Bill recalls his first Mokelumne River trout was in the Victor area and he caught them on Super Duper lures and Rooster Tail spinners. While Bill has fished several western states and areas in Canada, most of his fishing time has been on the Lower Mokelumne River below Camanche Dam. All things said, Bill has always considered this to be his “home water”. After a few life choices that included a career in the music industry, including a band that was the opening act for Hank Williams Jr on his “Whiskey Bent & Hell Bound Tour”, Bill settled down and has been married to his wife Debby for 30 years and they have raised two sons. Debby and Bill also managed to find time to play in a Bluegrass based band called “Stringin’ Along” where they just finished a sixteen year run playing venues throughout the Central Valley and Sierra Foothills. Bill started Mokelumne River Outfitters in February of 2006 with the idea of guiding and teaching fishing as a part of his retirement package. Sharing his knowledge and 50 years of experience, along with seeing his clients learn and be successful, is one of the most rewarding things Bill has learned to do. Leo has been fly fishing since the mid 60's. Leo started out fishing for trout and eventually graduated to black bass and shad. And of the two, bass became his passion. He's fished for largemouth bass on all kinds of water from farm ponds to exotic locations such as El Salto in Mexico. Come join us for another unforgettable session with Leo and don't forget to bring your NOTEBOOK !! Doug, with over 40 years of fly fishing experience, is the Owner and Master Guide for Calvada Fly Fishing. Doug is nationally known for his stillwater techniques as well as his river expertise. The clinics he runs and operates are second to none! Doug is also a contract fly tier for Umpqua Feather Merchants and is a recipient of the coveted “Cal Bird Fly Tying Cup”. When he is not on the water guiding he is fishing and scouting for the best angling opportunities. Doug's presentation will be “Calvada Stillwaters”™ which chronicles stillwater food items and their mannerisms in the water. The presentation looks at the “hatches”, when and where they occur and how to mimic them for optimum results. The presentation will also explain line control and line angles. The tactics presented in this presentation are proven from around the world! If stillwater fishing is what you prefer then this is the Club Meeting that you definitely do not want to miss !! Captain "KD" has been fishing for Largemouth Bass since his childhood. 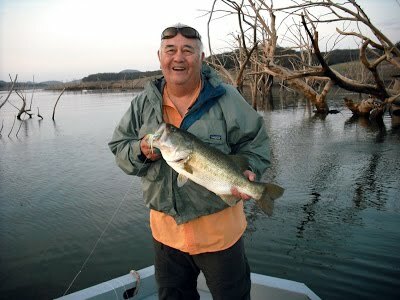 KD's passion for catching Largemouth Bass using topwater tactics began as a young boy over fifty years ago on the shores of Clear Lake in Northern California. He cast his first fly rod and a "Loyd's Luck Lures" balsa popper for big Clear Lake Bass. His passion for taking bass "on top" carried forth into his Delta fishing and guiding career, which established him as one of the premier Delta "Bass masters" utilizing fly fishing tackle and developing unique fly patterns and presentation techniques. KD has been featured in numerous articles in industry publications, including California Fly Fisher and Fly Fisherman (California's Largemouth Paradise, May 2007). Kevin authored the definitive Delta Largemouth article, "Tactics for Delta Bass" (California Fly Fisher, April 2001) which was ground breaking in bringing forth awareness to fly anglers about the Delta Largemouth fishery. KD has also been featured in books such as "Fly Fishing the California Delta" (Costello/Sherman), "Fly Fishing California's Great Waters" (Blanton), and starred a supporting role in "Bass: The Movie" (Howard Films). Kevin has been involved with lodge guide training, rod and tackle development, and educational seminars and presentations. Kevin currently resides in Stockton, CA. John is the West Coast Sales Representative for Simms Fishing Products & Hatch Outdoors covering CA, AZ, NV and HI. work published in Fly Fisherman, Fly Fishing Journal, Saltwater Fly Fishing, The Drake, California Fly Fisher, North West & South West Fly Fishing to name a few. John teamed up with Captain Mike Costello to produce the first and only Fly Fishing book dedicated to the California Delta, “Fly Fishing the California Delta.” He will be presenting his slide show “Elevate your Delta Fly Game” which will visually take you through this amazing fishery and how to improve your Delta skills. John’s passion for Delta fishing began at the age of 18 in 1993 on his first trip to California Delta and it now has been his “home” water since 2002. He now lives on the banks of the California Delta in Discovery Bay with his wife Natih, and daughter Kalum and son Kasix. Jay has been fishing this body of water for two plus decades and has found this to be the #1 waters for a wide variety of species. Jay has been fishing the waters of Mexico for 37 years and runs a fly fishing operation out of La Paz. You have three different types of water to fish, blue water, to rocky structure or sandy beaches. There is a wide variety of species one can catch. From Dorado, Roosters, Jack Crevalle, Yellow Fin Tuna, Sierra’s, Marlin, Yellow Tail, Wahoo, etc. In his presentation, Jay will cover everything that you will need to know and what you’ll need to do to have an enjoyable trip. By the end of the program, you’ll be ready for a trip to Baja to test out your equipment and your fishing skills. Steve Potter is shaking things up as far as programs go. He went out an invited a bunch of top notch fly tiers for our next meeting. involving their particular patterns from trout to marlin. Don’t miss this venue. Don’t be intimidated by these tiers. Bud Heintz is a master fly tier and innovative tier for Rainey Flies. on hand to tie his caddis pupae and caddis emerger if time permits. Jay Murakoshi hails from Fresno will be tying anything that comes to mind. 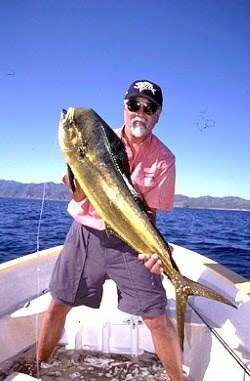 His Baja trips are just around the corner, so we wouldn’t be surprised if he ties some of his patented flies for the salt or even bass. While most men approaching 50 years are experiencing “Midlife Crisis”, Jeff seems to have died and gone to heaven. In 2009 Jeff quit his day job of nearly 25 years running a fly shop amidst the most difficult financial times America has experienced since the Great Depression. Why? It was to follow his dreams. Jeff wanted to focus on his art, travel the country to teach and entertain about fly fishing, do more writing and best of all not have to ask permission every time he had an opportunity to go on a fishing trip. His friends and family told him he was crazy, but his wife Granny supported the move. Well, let’s just say Jeff hasn’t learned the discipline of self employment yet. He simply works just enough to afford the bills and more importantly, the plane tickets he needs to fish the world. Put your seatbelt on and travel with Jeff to the most remote corners of the globe for the most amazing fish species ever pursued with a fly!